White jean season is back, y’all. 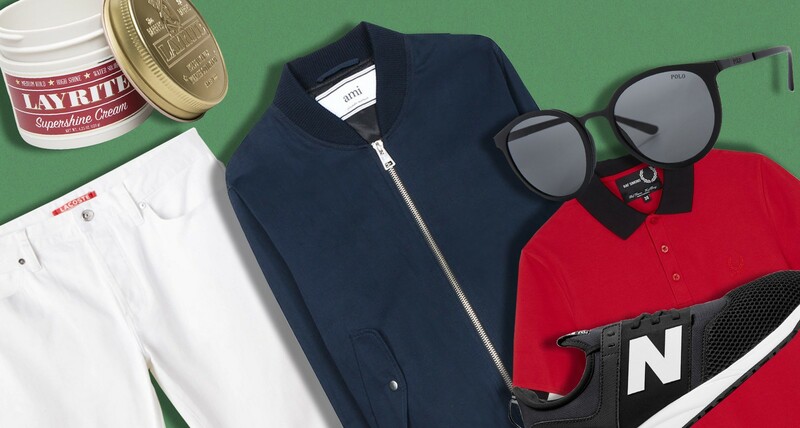 Keep ’em from looking too precious by wearing them with sportier pieces like a cool bomber, punk-y polo, and sleek sneakers for a laid back, yet still refined, look for the weekend. The bomber jacket trend isn’t going anywhere, so it’s time to pick up a lighter version that you can wear throughout spring and summer. Ami’s marine blue version is slim cut and made from a soft cotton-linen blend that works for both warm days and cooler nights. Leave it to Raf Simons to breathe new life into the polo. He’s tweaked Fred Perry’s classic shirt by tapering the shape and adding contrasting details on the collar and arm cuffs that break up the brand’s signature stripes. 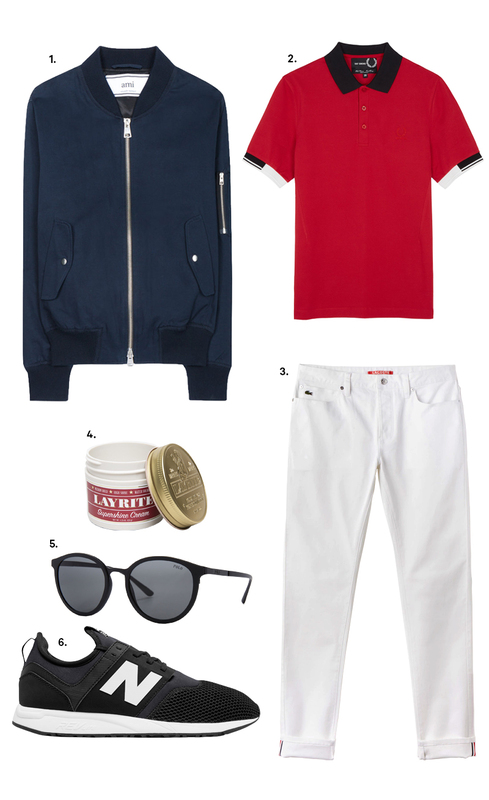 White jeans are a warm weather staple that will never go out of style. If it’s your first pair, these ones from Lacoste a good place to start: they’ve got a slim cut with a bit of stretch and minimal distressing. You want the pants to have a clean line and be unfussy, but be prepared to put in the work to keep them looking pristine. With winter behind us, you can’t rely on a toque to cover up a bad hair day, so put some effort into styling your coif before you leave the house. This Supershine Cream will keep your hair in place while still letting it move, and will also give your locks a healthy sheen. Sunglasses are taking a more understated approach this spring, and this pair by Polo is a perfect example. Matte black metal frames with matching dark frames and minimal branding, they’re clean and modern and will be your go-to all season. Warm weather also means it’s time to go sockless and bare some ankle again. The 247 Classic Sneaker has a fitted upper with mesh detailing that is comfortable and breathable, while the REVlite midsole is lightweight and makes you feel like you’re walking on air.